Today I am sharing very special event that not only brings together some of the the area’s most successful restaurateurs, it also benefits a cause that is dear and near to my heart. 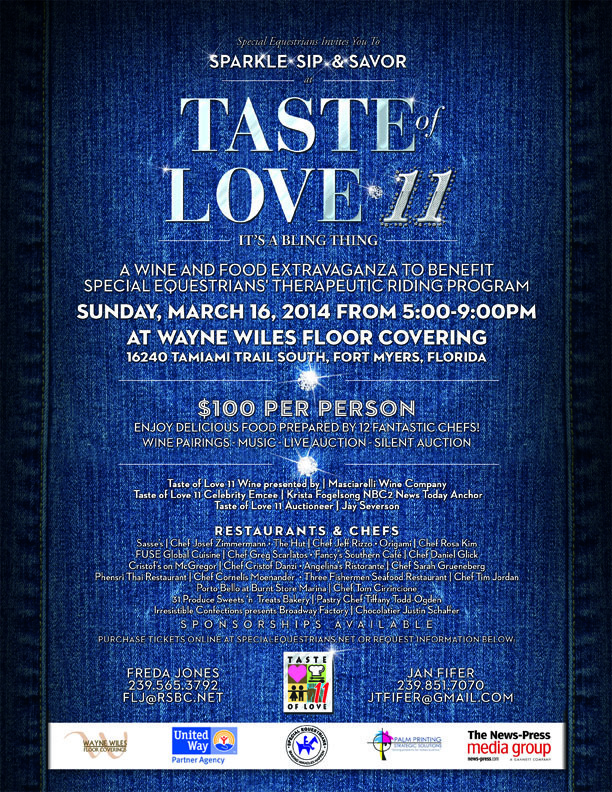 Taste of Love 11 – the annual food and wine extravaganza will take place on Sunday, March 16, 2014 from 5 to 9 p.m. at Wayne Wiles Floor Coverings in Fort Myers. All proceeds from Taste of Love 11 will benefit Special Equestrians, a nonprofit organization dedicated to helping children and adults with disabilities by providing a structured therapeutic horseback riding program and equine assisted activities. The popular event’s theme will be “Sparkle, Sip & Savor” and will feature dinner dishes from 12 of the area’s most successful culinarians, wine by Masciarelli Wine Company, live and silent auctions and entertainment. Local celebrity auctioneer Jay Severson and Krista Fogelsong , NBC2 News Today Anchor will oversee the evening’s events. Participating restaurants include Angelina’s, Cristof’s on McGregor, Fancy’s Southern Café, Three Fishermen Seafood Restaurant, FUSE Global Cuisine, The Hut, Irresistible Confections, Phensri Thai Restaurant, Origami Restaurant, Porto Bello at Burnt Store Marina, Sasse’s and 31 Produce Sweets ‘n Treats Bakery. Tickets for Taste of Love 11 are $100 per person and may be purchased online at www.specialequestians.net. Wayne Wiles Floor Coverings is located at 16240 Tamiami Trail in Fort Myers. More than 475 people attended the event in 2013, raising over $150,000 for the therapeutic horseback riding program. The event’s success is contributable to the 25-plus sponsors, in-kind donors and long-time supporters of Special Equestrians. Sponsorship and underwriting opportunities are available at http://www.specialequestrians.net. The Special Equestrians therapeutic riding program has been awarded Premier Accredited Center status by the Professional Association of Therapeutic Horsemanship. Serving Lee, Charlotte, Hendry and Glades counties, Special Equestrians is a United Way of Lee, Hendry, Glades and Okeechobee Counties Partner Agency that has been serving southwest Florida for over 25 years. The Best Lobesterfest is Here - Win a $50 Red Lobster Gift Card!